Greene County General Hospital’s Nutrition Services Department prepares healthy and delicious meals according to physician orders with accuracy ensured by diet clerks and dietitians. For inpatients, the cafeteria is open from 5 a.m. to 7 p.m. 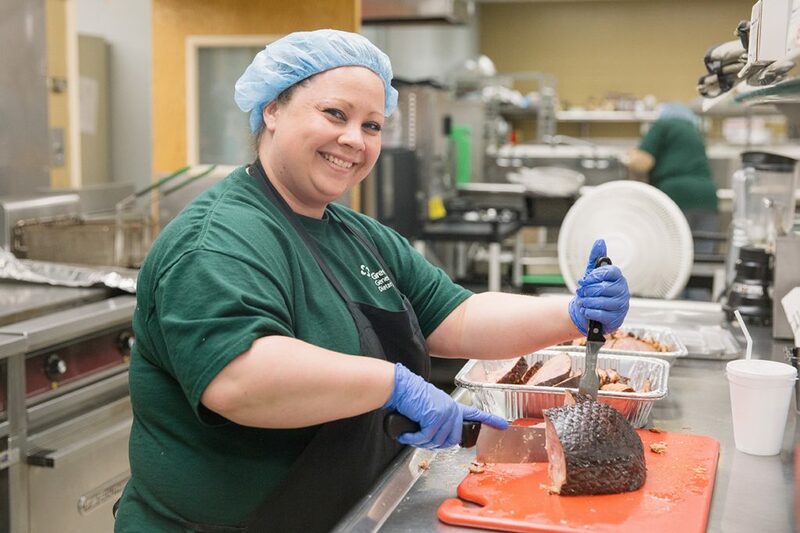 Meals are prepared daily and are served in the hospital’s cafeteria, which is open to the public. The cafeteria is open daily for breakfast from 7:00 a.m. to 9 a.m.; lunch from 11:30 a.m. to 1:30 p.m.; and dinner from 5 p.m. to 6:30 p.m. For the day’s menu, call 847-6177. The department also plans and prepares meals and snacks for workplace programs and meetings including medical staff functions, Chamber of Commerce meetings, and other professional meetings. Registered dietitians provide nutritional counseling to support and assist individuals in the management of chronic diseases. These services are available to inpatients as well as outpatients upon physician referral. The department’s employees receive continued food safety training and are current in all federal and state institutional food service guidelines. What we eat is a crucial part of staying healthy. In fact, a large body of evidence now shows that healthy eating patterns and regular physical activity can help people achieve and maintain good health and reduce the risk of chronic disease.